Particle & Surface Sciences have announced that the Micromeritics Gemini VI surface area analyser boasts improvements that benefit those applications that require extended analysis time and better stability. The Gemini was originally designed for use in the carbon black industry, the new Gemini VI boasts improvements to Micromeritics standard Gemini series surface area analysers that directly benefit not only carbon black producers and users, but also applications that require extended analysis time and better stability. A larger cabinet allows for longer sample tubes and a larger Dewar. 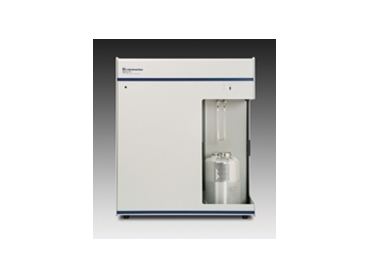 The larger Dewar provides a stable thermal environment in which to measure the isotherm resulting in improved repeatability from one sample to the next. The capability to monitor continuously the saturation vapour pressure (P0) of the adsorptive using a dedicated P0 tube and transducer has also been added. This feature allows the instrument software to accommodate, at each data point, any minute change in the saturation vapour pressure that may occur during the course of the analysis. These improvements combined with features such as automatically generated or user-defined pressure tables with user-selected endpoints, free-space determination and correction options, and a variety of reports make the Gemini VI a valuable tool for the determination of surface area and pore size distribution. The Gemini series of surface area analysers uses the Static Volumetric Technique to generate high-speed surface area and porosity data. There are two models in the Gemini V series, enabling users to get the analyser that would suit to their specific needs. Capabilities are further expanded on each model if the Windows software option is included. The Gemini 2365 determines single-point and multipoint BET and Langmuir surface areas, total pore volume, and micropore analysis by the t-method. Also included is the capability to determine statistical thickness surface area (STSA) of carbon black (refer to ASTM D 6556, ASTM D 3765, ISO/DIS 18852.2, or ISO/CD 4652-2/3). The Gemini 2380 has all the abilities of the Gemini 2365 and additionally can provide BJH pore volume distributions. Up to one thousand isotherm data points may be collected. Originally designed for use in the carbon black industry, the Gemini VI has features that directly benefit not only carbon black producers and users, but also applications that require extended analysis time and greater stability. A larger cabinet allows for longer sample tubes and a larger Dewar. The larger Dewar provides a very stable thermal environment in which to measure the isotherm resulting in improved repeatability from one sample to the next. The capability to monitor continuously the saturation vapour pressure (P0) of the adsorptive using a dedicated P0 tube and transducer has also been added. This feature allows the instrument software to accommodate, at each data point, any minute change in the saturation vapour pressure that may occur during the course of the analysis. It results in determined relative pressure.